A U.S. service member was killed Thursday by a roadside bomb blast while aiding the Iraqi-led operation to recapture the city of Mosul from Islamic State militants, the Pentagon said. The incident marks the first American death since the offensive was launched Monday, and the fourth U.S. service member killed in the two-year conflict against the Sunni extremists. U.S. officials did not disclose the location of the bombing or the victim's name, but said he died while being evacuated to a hospital after the bomb exploded around 7 p.m. local time. More than 100 members of U.S. special forces units are working close to the front lines by advising Iraqi commanders, calling in airstrikes and sharing intelligence, as Iraqi army and Kurdish militias push forward at multiple points. U.S. officials have emphasized that most of the 5,000 U.S. troops in Iraq are far from the front lines but that some are closer to the unfolding battle. 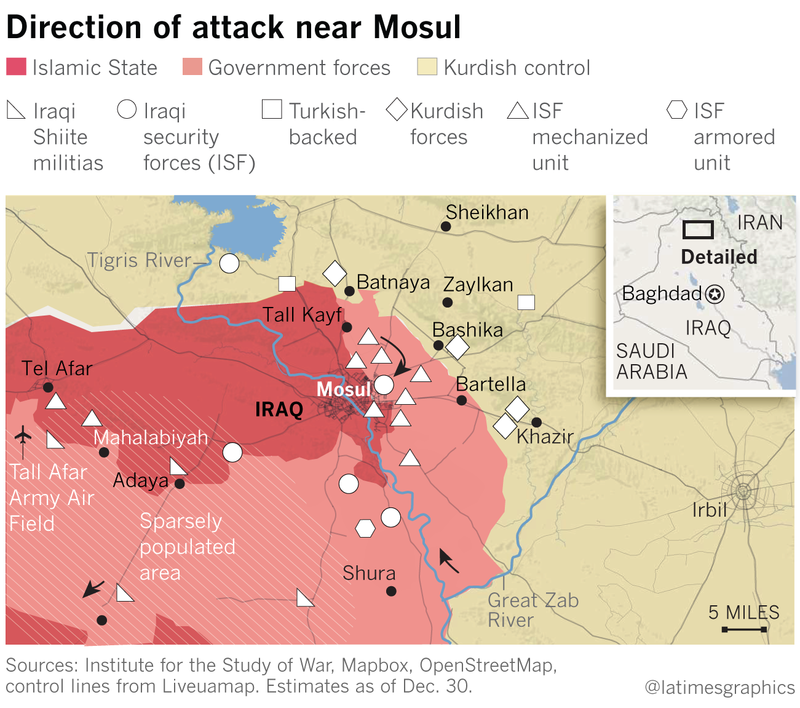 The fourth day of the offensive saw the Iraqi army and Kurdish forces begin a predawn two-pronged movement from the northeast and the east backed by U.S.-led coalition air attacks and heavy artillery. Iraqi special forces reportedly encountered heavy fire from the militants. The group has used suicide bombers and thousands of buried bombs and booby traps to slow the advancing troops. "It's a nightmarish, 'Home Alone'-type scenario," said a U.S. official briefed on the battle. Staff writer Brian Bennett contributed to this story.